Fasching, Fastnacht, Carnival – Helau! Are you ready for the last days of Fasching? Yes, the Carnival or ‘närrische Zeit’ of the year as some name it is coming to an end. The last week of Fasching, the actual ‘Fastnachtswoche’, is starting this Thursday with the Weiberfastnacht culminating in Rosenmontag (Rose Monday) and Faschings-Dienstag (also called Veilchendienstag) before Ash Wednesday calls an end to the time of costume balls and masquerade parades and fun. Even though some of the carnival’s roots go back to the Romans and their festivals of Saturnalia and Bacchanalia, the tradition of the Fasching and Carnival as we know it now started in the medieval times. Originally tied to the Liturgical Year Church Calendar Fasching or Carnival started officially on January 6th , Epiphany or ‘Dreikönigsfest’, and ended on Ash Wednesday ringing in the 40 days of Lent, during which time no rich foods, such as meat, dairy, fats and sugar and alcohol were allowed. In 1823 a special Carnivals committee in Cologne decided to have carnival begin on the 11. of November the same day as St. Martin’s Day but at the exact time of 11:11am. This seemed to create the perfect “Carnival date” of the 11.11 of any year at 11:11am. In Cologne carnival is part of the city’s history and this date marked the day of the official initiation of the Faschings Prince and Princess and the starting of costume balls and masquerade parties. The word Carnival evolved most likely from the Latin words carne and vale which means something like “say good-bye to meat”, announcing the time of fasting that would follow the excessive partying. Fasching , Fastnacht or Fasnacht (Switzerland) refers to the long night before the fasting starts . In fact the ‘long night’ means actually the six days from Thursday (Weiberfastnacht) to Faschingsdienstag (Tuesday before ash Wednesday). The word is thought to come from fasting and night but folk etymological roots point also to the word “Fastenschank”, which means the last (alcoholic) drink before the fasting. The term Fasching is mostly used in Bavaria and Austria. How Carnival is celebrated varies from region to region within Germany, Austria and Switzerland, and of course it takes on quite a different color and flavor if we go outside the German speaking countries. Think of the celebrations in other countries, like the Carnival in Venice or the one in Rio, Brazil! Parades and costume balls are custom all over Germany during carnival season with the biggest and most famous ones in Cologne, Mainz and Düsseldorf happening on Rosenmontag (Rose Monday). During this time scathing political and social commentary, fantastic costumes and normal citizens in the role of kings and princes, knights and generals are part of the fun while the rich and pretentious in society are ridiculed by “fools” and Court jesters. An institution for every serious Carnival Club is having an official “Faschings Prinzenpaar”, the Carnival’s designated Prince and Princess, who are getting elected for the Faschings season on November 11th and will guide the crowd of “Faschings fools” (das Narrenvolk) through all festivities. The two most used traditional salutations in Germany during Carnival are “Helau” and “Alaaf”. And what is the most famous Faschings food? The “Faschings” Krapfen! This delicacy resembles a doughnut, but definitely is not one, and it is absolutely essential to have them for every Faschings party! Many regions have their very own special Fasching traditions. In Munich for example everyone looks forward to the Tanz der Marktweiber at the Viktualienmarkt (dance of the merchant women of the Viktualienmarkt) on Faschingsdienstag (Tuesday), the Schäfflertanz and the traditional Weisswurstessen (Bavarian White sausage feast) on Rosenmontag (Rose Monday). On that day every guest in the inner city is invited by the local restaurants to indulge on a Weisswurst for Euro 1 each. But only from 9am to 12noon, since a Weisswurst needs to have been eaten before the midday’s bell ringing! Oh, and did you know…? The Weisswurst ‘was born’ in Munich on Rosenmontag during Fasching in 1857! Outside of Germany, Austria and Switzerland it’s sometimes hard to find traditional German foods. We are always on the search, and so far GermanDeli’s online store has never disappointed us and stays our favorite. 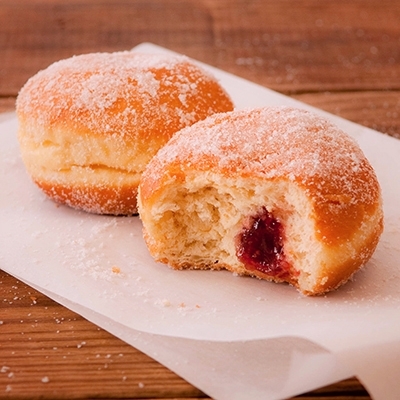 Their “Brezen” are delicious and, if you are looking for Faschings-Krapfen to highlight your own Faschingsparty, you can find them at their online store too! To top it all of, you can even host a traditional Weisswurstessen! We found Weisswürste, the typical sweet Mustard that goes with it, Brezen and Weissbier all at GermanDeli.com. Just make sure your “Weisswurst” is all eaten before the bell rings in noon! So, here is to you! Helau and Alaaf! Have a fun Carnival Week!